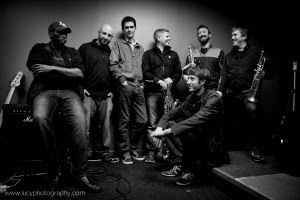 After a summer break, DJ Lubi' Soul Rebels night at the Wardrobe in Leeds is back with a bang with a 2nd Birthday Celebration featuring the Haggis Horns, Cleveland Freckleton and some special guests. The Haggis Horns will perform alongside three guest vocalists, all of whom feature on their soon to be released third album; John McCallum (Corrine Bailey Rae), Nia Saw (Zap Mama) and John Turrell (Smoove & Turrell). In addition to the Haggis Horns, a new soul/jazz record label will be officially launched. ATA (All Things Analogue) is a label run by Pete Williams and Neil Innes and is dedicated to analogue recordings and vinyl. To launch the label, Cleveland Freckleton (recently guest vocalist with the New Mastersounds) will front an 8 piece ATA band performing new, original material. This Birthday celebration marks two years of promoting high quality live music and the night has hosted a range of internationally renowned groups including Jose James, Riot Jazz Brass Band, Omar, Abstract Orchestra, Homecut, ExtraCurricular, Nubiyan Twist, Wonky Logic and more. Tickets are £10 and can be bought in advance from Seetickets, Jumbo Records, Crash Records and at the venue. Doors from 9pm, bands from 10pm until 12.30, club night until 3am. More information on the upcoming Soul Rebels season can be found on DJ Lubi's website.